This year will open with another exhibition of my photographs at the Carl-Schurz-Haus in Freiburg. 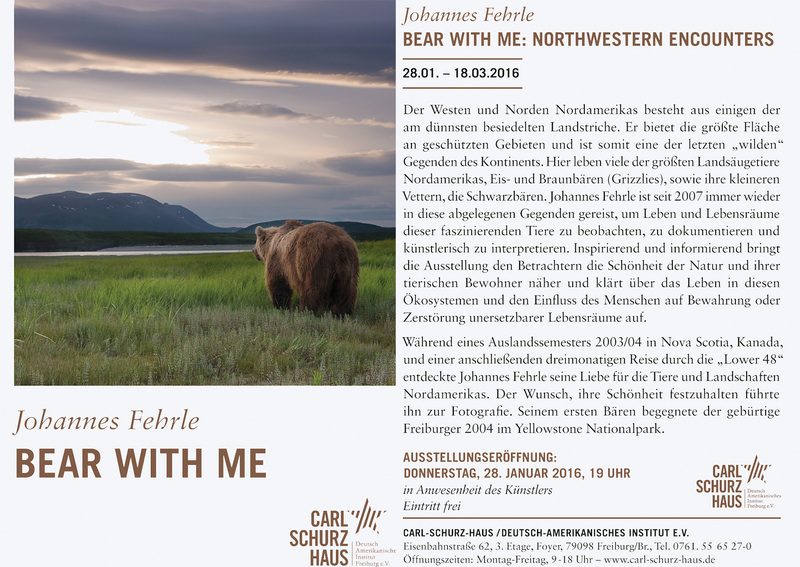 The focus of the exhibition is on what is perhaps my favorite animal, bears. It will include pictures of grizzlies, black bears, spirit bears, and polar bears which I have taken in Canada and the U.S. over the past seven years (or so) as well as some shots of their habitat. The opening is on Thursday January 28, 2016 at 7 p.m. I invite each and everyone to attend. Below is a digital version of the German invitation card. Click on it to get a larger view so you can actually read the text. This entry was posted on January 16, 2016 by Johannes Fehrle. It was filed under Uncategorized .